Setting the standard by which all other private golf communities are measured, Desert Highlands real estate consists of 575 homesites spread out amongst 850 acres of lush Sonoran desert. 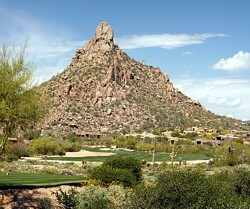 The Jack Nicklaus golf course and uniquely designed clubhouse have received international acclaim. The variety of tennis court surfaces drew admiration for providing residents a richer range of recreational options, not golf alone. Club & Golf Membership is inclusive of property ownership.